February 12, 2014. Graeme Smith wins the toss and chooses to field first against Australia at SuperSport Park in Centurion. 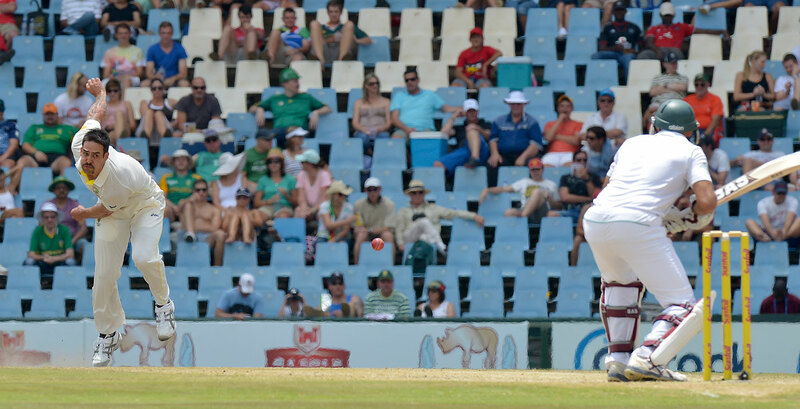 The South Africans have turned this ground into a fortress, having won 11 of the last 13 Tests. They have not lost here since the controversial encounter with England, where Hansie Cronje and Nasser Hussain made what was sold at the time to be a gentlemanly agreement to forfeit an innings each for the sake of a result. The one and only Australian visit here ended in a resounding eight-wicket defeat in a 1997 dead rubber but a lot has changed since then and Michael Clarke's side has come to lay down a marker. The Australians have rediscovered their mongrel after three consecutive series defeats - to South Africa at home and India and England away - and now possess the apex predator of world cricket in the form of the terrifying Mitchell Johnson. The left-armer has always been quick, but as he showed in the emphatic 5-0 Ashes victory, he can now combine destruction with accuracy. He has figured out how to deploy a creeping barrage on a batsman and only sends him back to the hut once he has pounded him to marmalade. With broad shoulders and swinging muscular tattooed arms, the handlebar-moustachioed Johnson obliterated England by picking up 37 wickets at 13.97 and is now focusing his crosshairs on a South Africa without the recently retired Jacques Kallis. 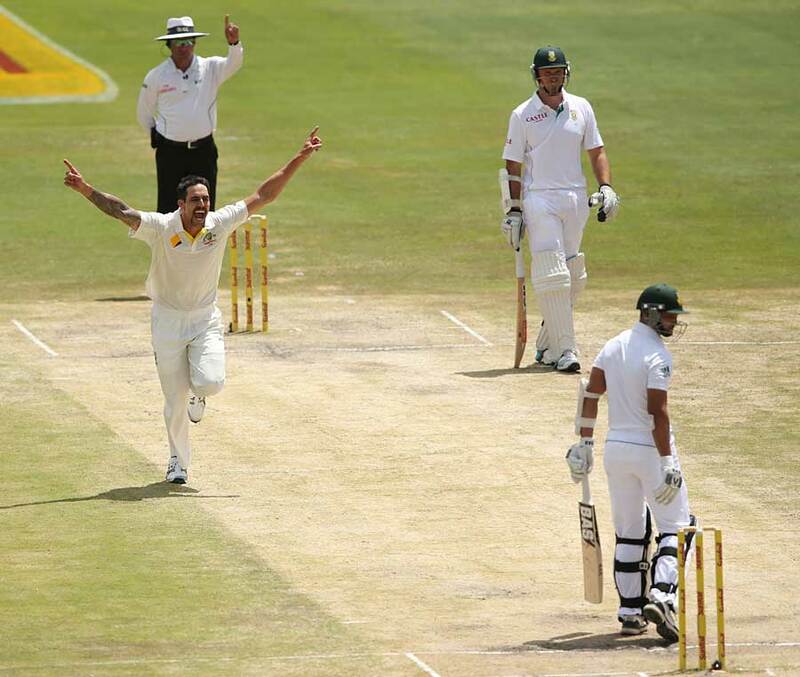 Mitchell Johnson: I was in the best form of my life and loving my cricket. We were feeling good as a team and we were up for this. Playing against South Africa always ignited my competitiveness. I just had the belief in myself and was doing things my way, which was being aggressive and attacking. South Africa know what is coming, how can they not? They'd been on the receiving end of a Johnson onslaught before, in 2008, when he claimed a career best 8 for 61 in the first innings in a losing cause in Perth. But knowing that a storm is about to break and bracing for it are two different things. Dale Steyn, South Africa strike bowler: We knew of the threat that Mitch presented and always banked on him being a serious challenge. We saw what he did in the Ashes. Johnson: The fact that they knew exactly what was coming didn't bother me. Some bowlers rely on variation and outfoxing a batsman. I did too, to some extent, but the way I saw it was - if it's coming down at 145 or 150kph, he has to find a way of playing it. Steyn: If a cricket side were a rock band, the fast bowler would be the lead guitarist who plays the solos. Not everyone is able to be the guy who can strike genuine fear in world-class batsmen. Mitchell was one of those bowlers and he'd use that fear to get you out. Michael Clarke would have just revved him up and let him go. Smith's decision seems vindicated. Shortly after lunch on the first day the tourists are in trouble when Clarke's is the fourth wicket to fall as he is caught at fine leg off a Steyn short ball with the score on 98. Despite the positive start, there is a sense of urgency among the South Africans. Ryan McLaren, South Africa allrounder: During my first spell I could tell things would become much tougher as the game went on. Morne Morkel, who was at mid-off, and I noticed that there was already uneven bounce in the morning session. We knew we had to restrict them to around 250 or else we may be staring up at a mountain. Impatient bowling and resilient batting combine to see Shaun Marsh (batting in a Test for the first time in two years) and Steven Smith (yet to score a hundred against a team not called England) combine for a fifth-wicket partnership of 233. Both are dismissed on day two with three figures to their name - Smith with 100, Marsh with 148 - and Johnson bludgeons six fours on his way to a handy 33. The Australians are eventually bowled out for 397, the second highest score by a visiting team in Centurion since India's 459 in 2010. McLaren: Marsh and Smith batted really well, but we were not at our best and could have had them out for much cheaper. Ryan Harris opens with the ball and Graeme Smith edges one through the slips and clips one through midwicket to kick things off for the hosts. But Ryan Harris is not the man everyone has been talking about. Ryan Harris is not the man everyone is afraid of. Ryan Harris is not the man who broke Smith's hand in Sydney five years ago. That man is Johnson and he's at the top of his mark with a mammoth total to play with. These are perfect conditions for a fast bowler. Perfect conditions for the apex predator. Johnson: It's a liberating feeling when you have a big total, especially for a guy like me who is just looking to steam in and bowl as quick as I can. I've had some epic battles with Graeme in the past and I knew he was expecting the short ball, so I held on to it a bit longer than I normally would have. Full ball, full ball, full ball and then bang! I got one to land on the perfect spot and it got huge on Graeme in front of his face and Shaun Marsh took a good catch behind the stumps. I always loved bowling to left-handers with my natural angle, because I could get it into their armpits, never a fun place for the lefties. 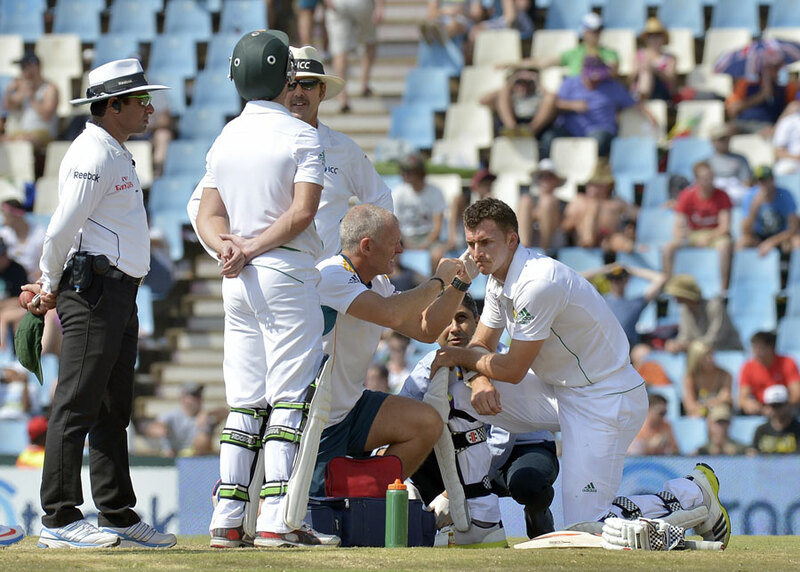 Steyn: It was a nasty one. Graeme was not one to jump around for nothing. McLaren: That raised a few eyebrows. It was sheer pace and was brutal to watch. We definitely took note of it and realised we were in for a fight. The ancient Greeks believed that the twin gods Phobus and Deimos ruled the battlefield. That fear could spread like a wildfire across a body of troops and reach men who had yet to engage in the combat. Watching South Africa's captain and colossus of an opening batsman look truly frightened sends a shock wave around the ground. Even those in the stands can feel it. Alviro Petersen, perhaps gripped with panic, wafts at a wide one and feathers a catch to Brad Haddin behind the stumps, handing Johnson his second. 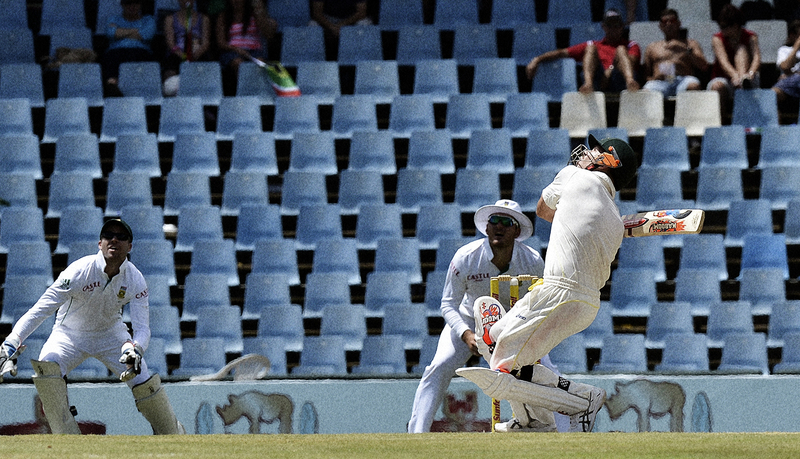 Peter Siddle traps Hashim Amla lbw and now South Africa are in a hole at 23 for 3. But Faf du Plessis is there. The same Faf du Plessis who had ground Australian knees to dust just 14 months ago with that indefatigable 110 not out from 376 balls across 466 minutes to save the Test in Adelaide. There is hope while du Plessis is there. Johnson: He was always one of the most difficult guys to bowl to. You need to deliver something special to beat Faf, and the ball that got him was. It flew at him [at 151kph] from a length and got his gloves. It was then that I felt that I was on a roll and could be on the verge of a great tour. That was one of my favourite wickets of my career. Steyn: There's not much you can do when a bowler is running through your team like that. You just have to hope that someone can stick it out. It wasn't the first time he'd done this to us, so we weren't too surprised. We knew he would bring the heat. Johnson: I was so pumped. I ran towards Faf and celebrated in his face. It was pure emotion. I would have definitely been reprimanded for that one if that happened today! The scorecard reads 43 for 4. Most people would be gripped by fear. AB de Villiers is not most people. He proceeds to fight back in a manner that only he can. He's pulling Johnson for six over long leg. He's driving Johnson for four through the covers. He's not merely batting on a different pitch to his team-mates, de Villiers is from a different dimension. He's playing a different sport and the apex predator is starting to feel domesticated. Johnson: AB de Villiers was the best player I ever played against. He probably had my measure throughout my career. I just couldn't figure out how to bowl to him. The first ball he faced from me that day, he walked across his stumps just as I was about to release and easily nudged me to the on side. He kept picking that gap through midwicket and made me feel like I wasn't bowling that quickly. He changed my mood as a bowler. Once he got settled, he started opening up and brought out all the shots. Steyn: That's just the way AB plays. He faces attack with more attack. Everyone was standing there like a dartboard, waiting to get hit, but AB walked across off stump and made Johnson change his line and then one half-volley later, smash! through the covers. He deliberately gets in extreme positions when things are tough because that plays on the bowler's mind. At one point you could see his leg stump. In JP Duminy, de Villiers has an able partner and the pair put on 67 runs for the fifth wicket. Whispers of Duminy's coming-of-age knock in Melbourne in 2008 start circulating around the ground. He has only scored one hundred since then. Could this be his next iconic innings? Australia's underrated fingerspinner Nathan Lyon sees Duminy leave his crease early and darts in a flatter one that forces the batsman to play a loose stroke. The ball is launched into the Highveld sky. Johnson sees it late and uses every sinew of his athletic frame to grab it with one hand above his head. A hundred and ten for five. Next up is McLaren, the man asked to fill the giant shoes of Jacques Kallis as South Africa's allrounder. A tough ask in any circumstance. McLaren: It was my first Test for four years. Of course I was nervous but I was up for the challenge and ready to showcase my talent against Australia and represent my country. That's what gets you up in the morning as an athlete. If McLaren is anxious he does his best not to show it. He survives 33 hostile deliveries and hits one glorious drive through the covers off Harris before he's beaten for pace by Johnson and loses his stumps. His stay at the crease lasts 37 minutes but time can stand still in the company of greatness. McLaren: For us mere mortals, standing at the non-striker's end, watching AB bat always makes you feel like he comes from a different planet. He had time against Johnson where none of us did. It showed his class. His ability to counterattack is unrivalled in cricket. Steyn: AB is a freak. He does what Johnno does with the ball, and that is strike fear in the opposition. He transferred that to Mitch. Johnson: I've never told anyone this but the worst thing for me was when a guy would block me and act as if I wasn't bowling fast. I didn't mind if a bloke charged me. It was the forward defence that irked me and AB played me so comfortably. It was such an unbelievable performance. South Africa hang on until the close of play and start again the next morning on 140 for 6. De Villiers is still there on 52. Robin Peterson is with him on 10 but he only lasts two overs into day three, becoming Johnson's fifth. Another short ball in to the ribs of a left hander from round the wicket, another feeble attempt to keep it out, another South African trudges off relieved to still be in one piece. De Villiers continues the fight alone and is the only South African batsman to hit a boundary for the remainder of the innings. Two fours off Harris, one four and one six off Lyon and three scintillating fours off Johnson. The last one is a thing of beauty and power, flaying a full ball up and over cover. It brings him to within nine runs of three figures. But as otherworldly as he has played, he is not the protagonist in this story. This can only end with Mitchell Johnson victorious. Johnson: I brought out the slower ball and I guess with AB in that mood he was always going to take it on but couldn't quite get hold of it and caught it with the toe of his bat. He picked out Davey Warner, who had to jump as high as he could at mid-off to take the catch. AB deserved a hundred. He showed nerves of steel. We spoke after the game and he told me that he was shitting himself the whole time. He didn't show it. He really is a fantastic cricketer. Johnson's next over, he is round the wicket to Morne Morkel and has the big man hopping and feathering a catch behind the stumps. South Africa are bowled out for 206, 191 runs in arrears and Johnson leaves the field to a standing ovation, having claimed 7 for 68 from 17.1 breathless overs. McLaren: We knew it wasn't good enough but just had to hold our hands up and admit that we'd been destroyed by some wonderful fast bowling. Steyn: I'm a fan of fast bowling. Though I don't like watching my team going through something like that, there is a part of me that can't help but enjoy it. It was like, "This is amazing. How fantastic to be a part of this!" Johnson: I never allowed myself to get carried away after just one innings, but leaving the ground with the visiting fans applauding me was a special feeling. Seeing young kids wearing fake moustaches was also something I never expected to see at an away ground. It told me that they enjoyed the spectacle. We're entertainers at the end of the day and as long as you're putting on a show I think the crowd will get behind you. I was very proud of my achievements that day. We're 35.3 overs into Australia's second innings and Warner latches on to a full and wide Morkel delivery and gives it the business through the covers. Warner has his sixth Test century from just 118 balls and is off celebrating in trademark fashion, leaping in the air as reluctant applause ripples around SuperSport Park. The away side have battered their hosts. Warner has led the way, and when Australia reach an insurmountable lead of 481 early on day four, Michael Clarke declares the innings and gets ready to unleash the beast one more time. Steyn: Once Johnno blew us away in that first innings it was always going to be tough to fight back. McLaren: The nature of the wicket meant we were facing a monumental task to get anywhere near their score. The talk was just to forget about the target and try and give a strong performance by batting deep and building partnerships. Unfortunately it didn't quite work out that way. It took Johnson five balls to get a wicket in the first innings. Now he needs just four as Petersen's leaden feet have him prodding away at a length ball. Johnson has 250 Test wickets. Momentum, luck, fate; call it what you want but the cricket gods were smiling on Australia. Debutant Alex Doolan takes two blinders at short leg, senior South African batsmen are made to look like amateurs, and the pitch is becoming more difficult to bat on. It's amazing someone hasn't been hit yet. McLaren: Given the way I went out in the first innings I was conscious to be strong in my forward defence and to be confident with my footwork. I triggered forward but when I saw Johnson land a short one in his half of the pitch, I figured I could get underneath it. I made the mistake of taking my eyes off the ball. Having said that, on a normal surface it would have sailed over my head. McLaren is hit near his left ear with a sickening thud. He is visibly shaken and there's blood. The physio is on the field, conducting a concussion test. Even Johnson, the apex predator of world cricket, is concerned. Johnson: It's a Catch 22 for a fast bowler because you've deliberately bowled a short ball and used it to intimidate, but at the same time you never want to actually hurt someone. When he went down, my initial reaction was to see if he's okay. I sent Faf a message after play to see if [McLaren] was all right. I'm not the kind of guy who ever enjoyed hurting people, but that is part of the game. What sort of bowler would I be without intimidation? What would the sport be without bouncers? I never let those incidents stop me from being the aggressive bowler I was. South Africa capitulate. With the shambolic run out of Morkel, they are bowled out for 200 and lose the match by 281 runs. 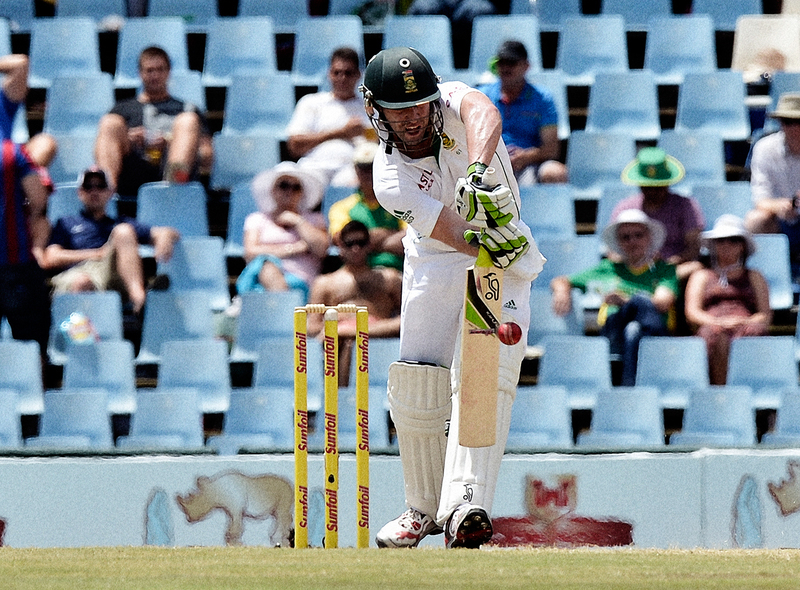 De Villiers top-scores again with 48, and is again dismissed by Johnson. A concussed McLaren, a broken Vernon Philander bat and a dented Hashim Amla grill speak of the psychological scars inflicted on a nation that has not seen anything like this before. Shane Warne was a wizard, Glenn McGrath was a sniper, but Johnson smashed into South Africa like a Mongolian horde. His match haul of 12 for 127 is still the best bowling performance by a fast bowler against South Africa since readmission, and will remain the best performance by a fast bowler on South African soil since World War I until Kagiso Rabada's 13 for 144 against England at the same ground two years later. McLaren: We were outplayed. It's as simple as that. That would be my last Test match because I missed the next one, in Port Elizabeth, with that concussion. We won that game and as things panned out, I wasn't picked again. Of course I would have loved to contribute more and obviously not get injured but I can always say that I took part in that epic match. Steyn: I play this game for many reasons. I play cricket because I'm good at it and I really love it, but I also play for experiences, even if I wasn't the best player in the match. One day when I'm 70, I'll be able to tell my grandkids that I played against this massive Australian with a handlebar moustache who bowled us black and blue and absolutely ripped us to shreds. Johnson: It was nice to get one over them and get back at them after they beat us on our own patch. It was just one of those games that worked out perfectly for me. I was in the best space both physically and mentally. I'll never forget that match and it will always bring a smile to my face.